The middle of the West Texas desert isn’t the first place you’d expect to find a fully stocked Prada store but just a few miles outside of Valentine Texas that what you will find. Ok it not an actual Prada store its front door doesn’t open and it only has right shoes and the purses have no bottom even if you find one you want you can’t buy it. You will need to go to real Prada store for that. Needless to say there are some that will do anything to shop there and it has been vandalized several times now so the creators put in a security system with gps devices in the purses and camera and stronger glass for those considering a dark night break in. Other wise it is a great place to drive out to and get your selfie of you and Prada Marfa store to prove you were there if thats your thing. The two artist that put this together Elmgreen and Dragset decided this was the place for their art display. Maybe they were trying to prove that people will drive to the end of the planet to get a selfie not sure what it represents, consumerism, or humor whatever it has made a mark on the tiny town of Valentine. The one nice thing is that made it of biodegradable adobe like material so over time it will go back to it natural state. The spent around 80,000 on this so hopefully it will take a while so they get there money out of it. On our latest trip to west Texas we decided to see if we could capture the famous Prada Marfa building with a background of stars. The one thing about this area of west Texas is its wonderful dark skies where you can actully capture stars. The road between Marfa and Valentine was so dark we thought we might have missed it because it was so dark, but finally, there it was just feet from the road in all it glory waiting for the next photo or selfie, that seems to draw people out here. The permanet exhibit was created by two artist Elmgreen and Dragset in October 2005 to resemble an actual Prada store. The two refer to their work as pop architectual land art with a bit of humor. They built this structure about 24 miles outside of Marfa in a city called Valentine Texas population around 200. To make it more interesting they found the least likely place to find a store like this and stuck in in far west texas. They added only right shoes and the purses have no bottoms. They have been vandalize several times now I guess people in this area like prada more than they knew. I am not sure what they were saying or not saying about their art. Maybe they were making fun of consumerism but you would have to ask them. As a photographer it great fun to shoot such a unique image. After the latest vandalism they have install cameras and the purses have GPS devices inside that detect movement so making it more difficult to shop there in the future. We had been to see the Marfa Lights many times but never venture over to Valentine to see the Prada Art display and we were glad we finally made it. Having this wonderful starry night sky really helped it pop out as a winning venture for us. Thanks for looking. 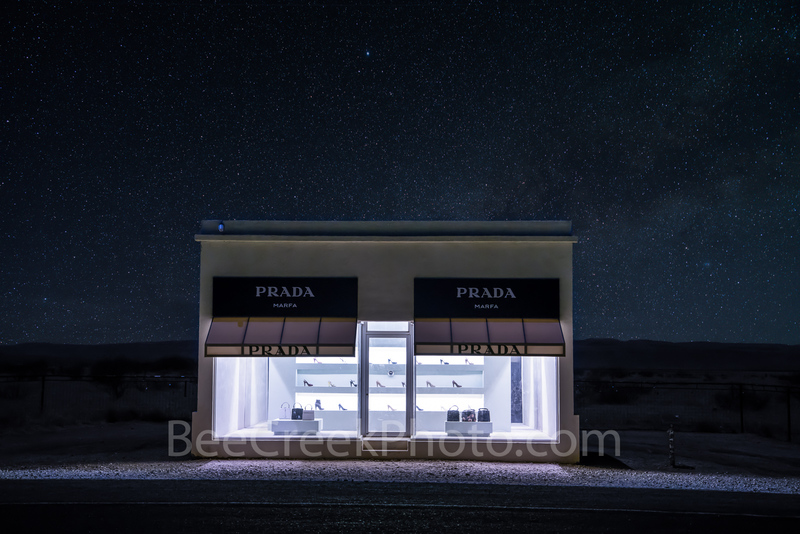 Posted in Photo of the Day and tagged artist, dark, dark skies, Elmgreen and Dragset, Marfa lights, night, night skies, pop architectural land art, pop art, Prada Marfa, purses, shoes, starry, stars, store front, texas landscape, Valentine Texas, west texas on March 16, 2018 by Bee Creek Photo. Dallas Margaret Hunt Hill Bridge Reflection Pano – This is a reflection of the Dallas Margaret Hunt Hill Bridge vertical panorama with its reflection in the water of the Trinity river after dark in downtown. The Dallas Margaret Hunt bridge was completed in 2012 and has become a big tourist attraction for the city. Dallas historical importance was due the city locations as a transportation hub for cotton and oil and being located along the railroad. Dallas is the third most populous city in Texas behind Houston and San Antonio. Dallas is also one of the fastest growing cities in Texas. Today Dallas host many fortune 500 companies, and is know for it high tech industries. 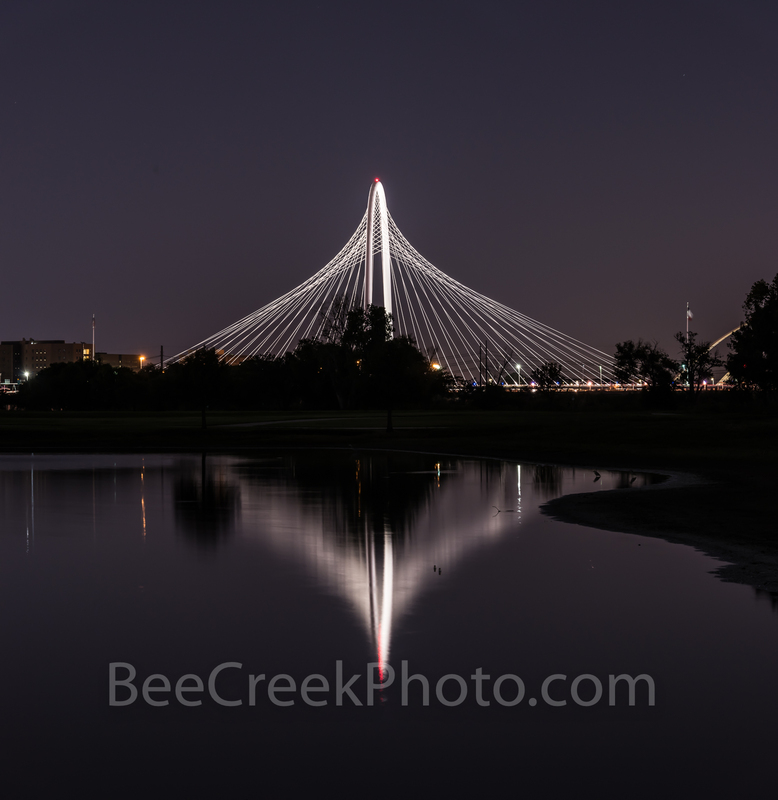 Dallas Reflection – This is a reflection of the Margaret Hunt Hill Bridge vertical panorama with its reflection in the water of the Trinity river after dark in downtown Dallas. This bridge was completed in 2012 and has become a big tourist attraction for the city. Dallas historical importance was due the city locations as a transportation hub for cotton and oil and being located along the railroad. Dallas is the third most populous city in Texas behind Houston and San Antonio. Dallas is also one of the fastest growing cities in Texas. Today Dallas host many fortune 500 companies, and is know for it high tech industries. 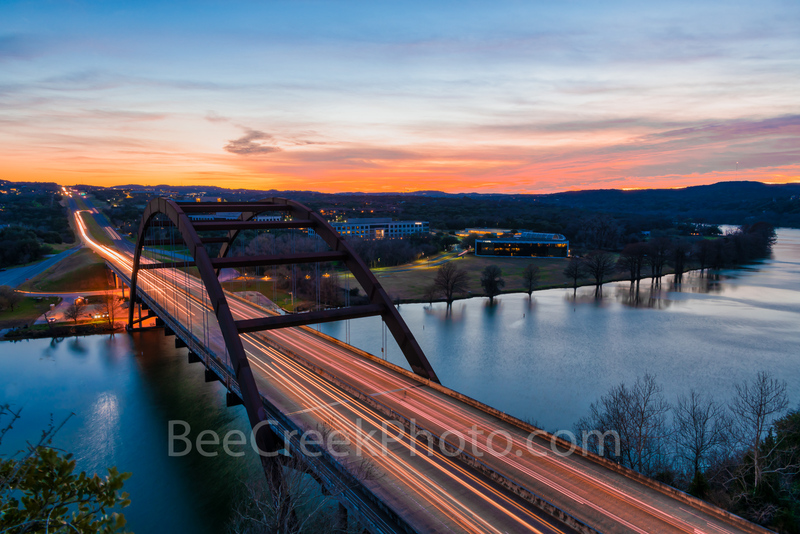 Posted in Photo of the Day and tagged Dallas, Dallas Magaret Hunt Hill bridge, dark, Fortune 500, high tech, historical, Margaret Hunt Hill Bridge, night, pano, panorama, rail, railroad, Reflection, reflects water, Trinity river on December 18, 2017 September 25, 2018 by Bee Creek Photo. 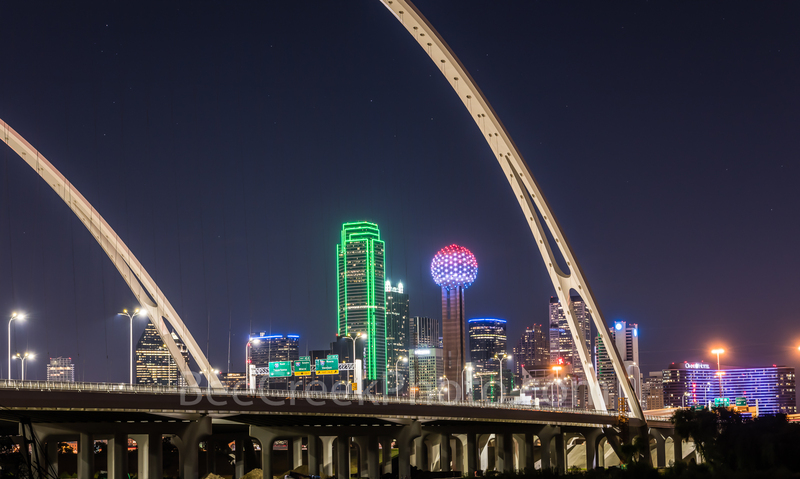 Dallas Skyline with Margaret McDermott Bridge – The new Margaret McDermott Bridge in downtown Dallas with skyline after dark. This is a steel bridge suspended with two arches over the Trinity River previously IH30 and is part of the Trinity project partially designed by Santiago Calatrava. This bridge is also designed to accomodate a pedestrian and bike path to join the the area other hike and bike trails. 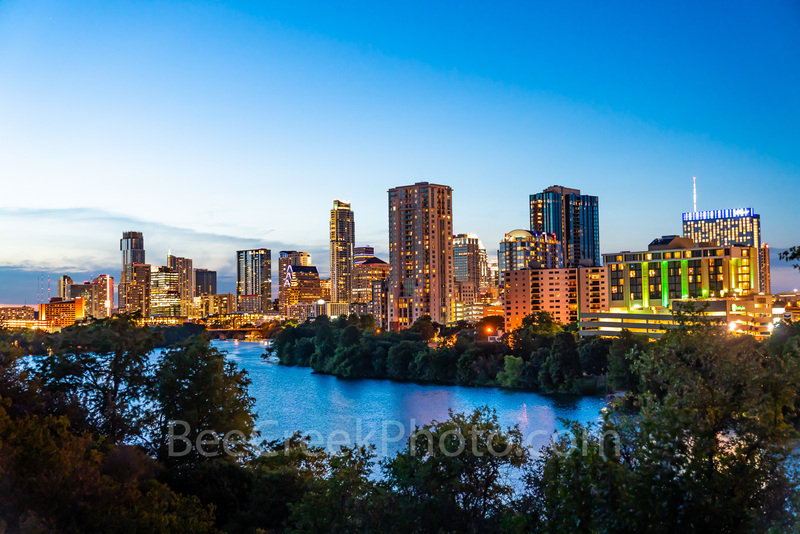 Posted in Photo of the Day and tagged art museums, Bank of America plaza, buildings, Dallas cityscape, dallas downtown, Dallas Magaret McDermott Bridge, Dallas Skyline, dark, downtown, high rise, Margaret McDermott Bridge, modern, Omin Hotel, Reunion Tower, santiago, skyline, Trinity project, Trinity river, urban on October 13, 2017 September 25, 2018 by Bee Creek Photo.